Home / Dog behaviour / Can dogs actually smile? We’ve re-homed thousands of dogs at our dog Rescue. 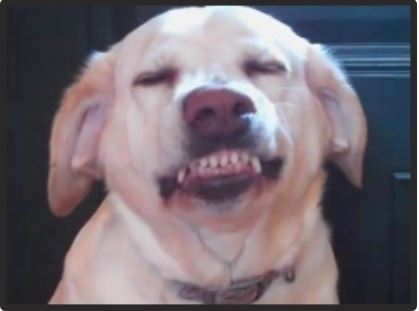 A trait that I periodically saw in a percentage of these dogs was the “Canine Smile”, where the lips are pulled back and the front teeth showing.This is easily mistaken for aggression as dogs cannot smile in the same way as humans. Smiling dog’s eyes are generally closed down; an aggressive dog’s eyes are invariably kept wide open. Smiling dog’s ears are in a normal posture; aggressive dogs generally have their ears tightly folded back against their heads. Smiling dog’s fur on back of neck and shoulders is not raised-up; aggressive dogs usually (not always) hackle. Tail is generally wagging in a somewhat rapid tempo; aggressive dogs don’t wag, or if they do it’s a slow-measured beat. Answered by Mikeys chance canine rescue.